Something tells us the early pioneers of the cellphone never could have imagined that one day it might be a decent substitute for baby bottles and pacifiers. But according to a survey released by Asda, a supermarket chain in the U.K., 27 percent of mothers hand a phone over to a crying or whining kid rather than a toy. Compare that to the 25 percent of moms who still use a bottle, 21 percent who hand over soft toys, and the nine percent who give their kids pacifiers. 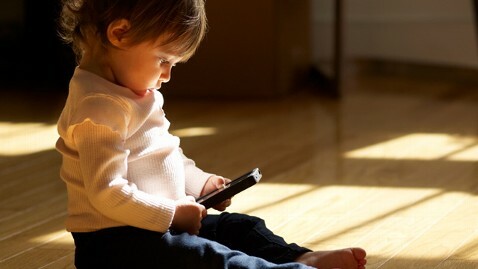 First reported by the Daily Mail, the survey found that 40 percent of these parents restricted playtime with the digital devices to ten minutes. One in ten admitted to allowing their children play with their phones for up to two hours at a time. The Asda poll was based on responses from 1,650 mothers. There are thousands of apps aimed at children, including learning games and interactive cartoon apps, but there has also been great debate about how much screen time is too much for children. The American Academy of Pediatrics recommends limiting a child's use of TV, movies, video and computer games to no more than one or two hours a day. A study in the Archives of Pediatric & Adolescent Medicine in April said that preschool-age children in the U.S. don't get outdoors enough.